David Cody, who received his Ph. 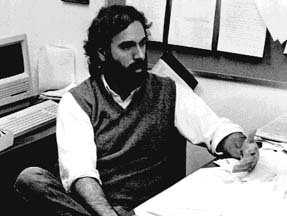 D. in English and American literature from Brown University in 1989, was one of the original team of three postgraduate and postdoctoral assistants who worked with Landow to create materials for Intermedia, the hypertext system that the Institute for Research in Information and Scholarship (IRIS) designed and produced between 1986-1988. Cody wrote many of the general materials and chose many of the original digitized images, most of which have since been replaced when the capacities of equipment have improved so dramatically. In this photograph, he is sitting near the one of the original Apple Macintosh computers on which he wrote many of his essays. Dr. Cody, winner of a Fulbright Scholarship to Japan, has since taught at the University of California, the University of Oklahoma, and Hartwick College, where is now Professor of English. His dissertation is entitled "Black Conceit: Art And Anxiety In Hawthorne's Fiction" (1989). His articles and essays on Nathaniel Hawthorne, Herman Melville, Emily Dickinson, Edgar Allan Poe, Walt Whitman, James Fenimore Cooper, Henry Adams, Sir Arthur Conan Doyle, William Faulkner, and H. G. Wells have appeared in journals including The New England Quarterly, Modern Language Studies, The Emerson Society Quarterly, The Nathaniel Hawthorne Review, The Melville Log, The Emily Dickinson Journal, The Journal of Modern Literature, Essex Institute Historical Collections, The Sherlock Holmes Review, and Language and Culture, and in books and annual volumes including Bloom's Modern Critical Views, Literature in the Early American Republic, and Reading Cooper, Teaching Cooper. He has contributed essays to The Oxford Encyclopedia of the Modern World.